This month in SCN’s print edition, I had the fortunate opportunity to interview Chris Miller, executive director of Professional Systems Network International (PSNI), for our The Way They See It column. He took me through the trajectory of his career, pinpointing many of the valuable lessons he learned along the way. Some of those included how mentorship and friendships were instrumental in growing his business, how planning for growth varies dramatically in a public versus private company, the challenges of leading and managing an organization that undergoes rapid growth, and of course adapting to the tumultuous change of declining margins and the effects of the internet pricing model. 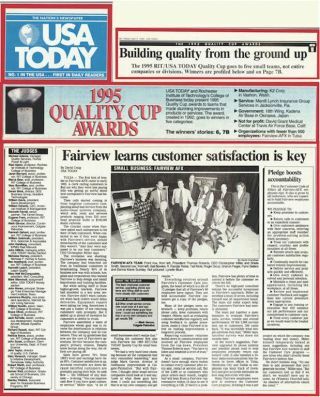 The 1995 USA Today article about Fairview-AFX and its Quality Cup award. In addition to company president Thomas Roberts and CEO Chris Miller seated in the front, a special shout-out goes to SCN columnist R. Randal Riebe standing second from the left. [Click to view larger image] One of the most valuable lessons might have been how it’s easy to get so caught up in technology and lose focus on good business principals in the process. Chris shared an illuminating anecdote along these lines, which did not make it into the print version of the article, so I’ll share it here. They constantly measured and monitored the results, which ultimately led to a USA Today Quality Cup Award, a “highly-coveted” honor given out by Rochester Institute of Technology (RIT) and USA Today for teams of under 500 employees that had distinguished themselves with a commitment to quality and customer satisfaction.